A50 Wireless Headset + Base Station (Gen 3) PS4/PC reviewed using a variety of devices, but mainly a PS4 Pro and Windows 10 PC. At times during the review, the A50 Mod Kit was also used. For years, ASTRO Gaming has been pushing a set of striking design philosophies into gaming audio, and both the wired A40 and wireless A50 headsets are key players in the console space. Featuring a distinct look and a lightweight and flexible frame, the wireless A50 headset has been a good wireless surround option on the PS4, but there have been some rough spots to go with the slick look and feel. With the new Gen 3 A50s, ASTRO has managed a major redesign which includes new wireless tech, new MixAmp features, software customization, a magnetic charging cradle/base station, and even some TR features like an available A50 Mod Kit. This redesign retains the headset form factor and lightness, and both the PS4 version and Xbox One versions are well-suited for use on the PC. At first glance, it might seem the blue and black PS4/PC Gen 3 A50 is not much different from the 2014 A50, but really, this new A50 is a major upgrade. The older A50 base station and controls didn't work well for me as I felt like I needed to be close to the base station to make adjustments. 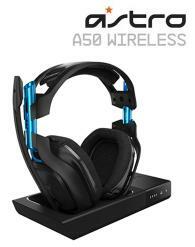 In contrast, the new A50 Wireless Headset + Base Station is a much smarter design. When not in use, the A50 sits in magnetic cradle right next to the PS4 Pro or on the desk above my desktop. It looks great, and it has a nice stable place away from pets to sit and charge. The only control on the cradle is a switch which sets the headset in either PS4 or PC mode. In use, the light A50 has nearly every control I could want on the headset (on the right side), and thereby close at hand. There is a power switch, a Dolby Headphone 7.1 Surround button, an EQ selector switch, the volume wheel, and two buttons on the side for setting the Game/Chat balance. The mic mute is still controlled by flipping the mic up on the left, and while this works, I'd prefer a button or switch (at least as an alternate). I do like flipping up the mic when not needed. On the PC, only the USB connection to the transmitter base is needed, and even console-only users will want to connect to a PC in order to use the ASTRO Command Center software. Adjusting the mic, customizing the EQ and EQ presets, updating the firmware, and even adjusting the side tone- this is all done through the PC software. The headset will store three EQ presets/custom presets, which is nice, especially when comparing different options. The software is robust, but the equalizer customization could use some help. The mic settings are key to maximizing performance in a given environment, but the mic isn't as strong I would like, especially considering the boom design. The buzz found in the right ear of previous models is nowhere to be found. ASTRO continues to push the A50 as a home theater/living room/bedroom device, and this comes through in use. Playing 'The Last Guardian' with the A50 on the PS4 Pro, and the audio is a delight. Heading into 'Battlefield 1' or 'Rainbow Six' on the PC, and the sound is tactical. There is precision, and the bass level is pleasant. On both the PS4 and PC, there is some set-up required (setting up DD5.1 on the PS4 Pro optical and setting the Game connection as the Default Device on the PC). Without the correct device side config, the user is likely to be very disappointed. Dolby Headphone powers the surround, but with a simple button press, the normal stereo of the drivers can be assessed at any time. At the very least, those interested but not sold on headset surround sound should some interesting conclusions with the A50. The headset is light and balanced, which is nice to find in a wireless set. My 7 and 3/8s head size is nice and comfy, but very large head sizes might not fit well. Wireless performance is great, but that's at a short distance, like 15 feet. The battery life is wonderful. The headset has a gyro which helps to detect movement and activate a standby power-saving mode, and this alone actually makes it challenging to test the battery life. Some of the A40 TR features have come over, namely the easy to remove/change ear cups, and the availability of a single A50 Mod Kit. The A50 comes with fabric ear pads and head pad, which are nice and breathy. Unlike prior designs, the ear pads have a plastic inner shell and connect to the headset via three magnets. So even without a Mod Kit, it's extremely east to remove the ear pads, say for cleaning or replacement. The head pad has to be snapped out, which is good if you know how to do it (pulling both front and back sides out), but can be disaster if not done right. The A50 Mod kit includes three pieces, which consist of a L ear pad, a R ear pad, and a head pad. All three use a synthetic leather material, though the ear pads still have fabric on the inner opening. Using the A50 Mod Kit closes up the headset a bit, providing more passive noise cancellation along with more padding. For someone who likes tweaking the feel, this is a good accessory, but I would not describe it as essential. The Mod Kit slightly changes the look of the headset, but that is mainly confined to the outer part of the head band. The A50 Wireless Headset + Base Station is an all-around improvement that makes the A50 worthy of its premium product status. I would like to see the software become a little more user-friendly, and I think the mic is merely ok. As a lightweight wireless surround headset, the Gen 3 A50 pairs wonderfully with the PS4 Pro while also being a nice and easy option on the PC.